This was the first male southern carpenter bee I had ever seen. When it first flitted past, I thought it might be a dragonfly with its loud wings and flashy colors. After chasing it around a blueberry field for the better part of an hour, I was now sure of two things: this was actually a bee, and it was in fact the coolest bee in existence. As if its rusty orange thorax and metallic dark blue abdomen weren’t enough, this robust bee had lime green eyes! 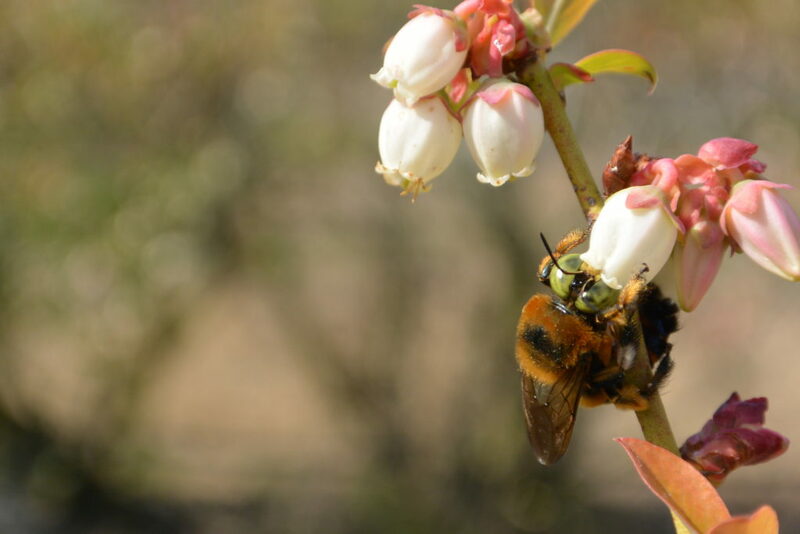 Being relatively new to both Florida and bee research, I had no idea that southern carpenter bees (Xylocopa micans) are in fact quite common, particularly in the central Florida blueberry fields in which I was working. I have seen many of these friendly creatures since, but am always reminded of my first encounter with the southern carpenter bee when I was sure I had discovered the rarest bee in the state. Check out the Honey Bee Research and Extension Laboratory at University of Florida on their website and Facebook!